Agios Pharmaceuticals actually delivered an encouraging strategic outline at the J.P. Morgan Healthcare Conference, but wound up being derailed by investor sentiment. What: Shares of Agios Pharmaceuticals (NASDAQ:AGIO), a clinical-stage drug developer primarily focused on researching cancer and rare-disease treatments, were hammered in January, falling 35% based on data from S&P Capital IQ. The primary culprit behind the decline? It wasn't fundamental. Look no further than investor skittishness. So what: The primary reason that Agios Pharmaceuticals was throttled in January was weakness in the broader market. The first two weeks of 2016 marked the worst start in stock market history, and industries which tend to be the most volatile, such as biotech, took it on the chin. 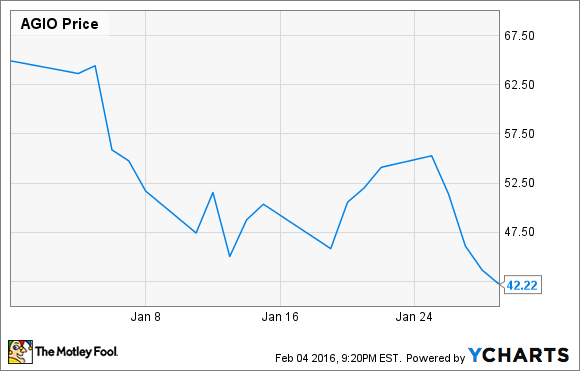 In January, the Nasdaq Biotechnology Index lost a whopping 21%. But why biotech and companies like Agios Pharmaceuticals in particular? Biotech is an easy target because nearly nine out of 10 publicly traded drug developers aren't generating recurring profits. When there's talk of a recession or a growth slowdown, businesses with the most built-in premium -- usually biotech -- are the first to deflate. A drug developer like Agios is unlikely to bring a therapy to pharmacy shelves for at least a few more years, implying that its cash burn could act as a cement block on its valuation. Adding some icing on the cake, Agios' short interest also rose in mid-January from the prior month. Now what: The real irony here is that Agios reported encouraging news at the J.P. Morgan Healthcare Conference in mid-January. At the conference it outlined some of its top strategic goals, which include advancing its IDH-mutant inhibitors that it's partnered with Celgene (NASDAQ:CELG) to develop and the advancement of its PKR activators. At the Super Bowl of healthcare conferences, Agios announced that it expects to complete enrollment for the expansion cohorts of its phase 1/2 study of AG-221 and phase 1 study of AG-120 for patients with relapsed-refractory acute myeloid leukemia (AML) by the second half of 2016. It's also on pace to initiate a phase 3 trial studying AG-120 in frontline AML, and plans to initiate an expansion arm study of high-risk myelodysplastic syndrome patients with AG-221. Agios outlined a handful of solid tumor indications for its IDH-mutant inhibitors as well. The allure of these IDH-mutant inhibitors has been their early stage efficacy, which for AG-221, an IDH2-mutant inhibitor, was a 37% response rate in refractory AML patients. This is why Celgene has been more than willing to exercise its licensing option on the development of these IDH-inhibiting therapies. In other words, from the perspective of an investor, the reasons for owning Agios were only strengthened in January. If there's any negative takeaway it could be that Agios will primarily be initiating trials rather than reporting data in 2016; but the company ended the third quarter with $352.4 million in cash and cash equivalents, which leads to an exceptionally long cash runway and few fears of a cash crunch. Agios isn't for the faint of heart, and it's still a very risky investment considering its focus on early stage, but first-in-class, developments. I would encourage savvy biotech investors who understand these risks to consider giving Agios a deeper dive following its precipitous sell-off.